Kratos faces a new beginning! Venture into the brutal Norse wilds with one of gaming's most recognizable icons! 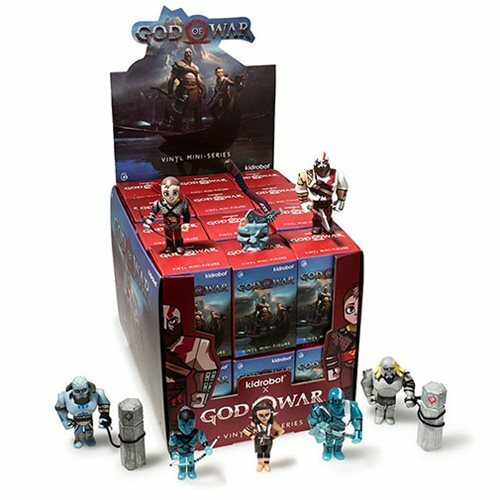 Mini-figures based on the 2018 video game God of War 4. Display tray contains 24 randomly selected, individually blind-packaged mini-figures. From the 2018 video game God of War 4, comes an amazing assortment of mini-figures by Kidrobot. You'll want to collect all 8 and become a true survivor of Norse lore! From Santa Monica Studio, comes a new beginning for one of gaming's most recognizable icons! Living as a man outside the shadow of the gods, Kratos must adapt to unfamiliar lands, unexpected threats, and a second chance at being a father. Together with his son Atreus, the pair will venture into the brutal Norse wilds and fight to fulfill a deeply personal quest.